Posted November 1st, 2013 . But he really looks like he’s sorry. 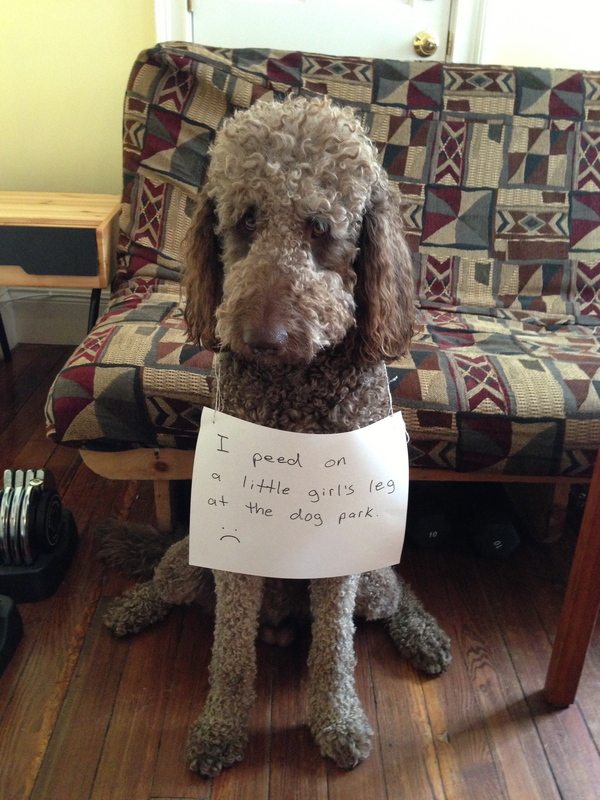 Getting peed on at the dog park is a risk we all take, and it’s happened to me. Comes with the territory…there, there, Murphy! You bring a kid to a dog park you take your chances. What an amazingly contrite face Murphy has! I love it!! Our Yorkie ran out during Trick or Treat. When a little lion picked him up, he dribbled on her cute costume. I would have told her to think of it as an honor! He was marking his territory – he wanted to keep her. Greatest face ever! Please, if a little pee is all you get on you at the dog park count yourself lucky. He was simply being sincere, “I own you lit’ one!” LOL! Dogs do what dogs do. If you can’t handle a little pee, you need to stick to cats! Murphy is quite the cutie. He does look incredibly sorry. Maybe he’s just sorry he couldn’t keep the girl to be his friend!! Whats a little pee on the leg amongst friends ? Its better than poo on the shoe ! Love all of your comments, Computiac!